How has Med-Eye Wash helped others? How do I use Med-Eye Wash? Stinging eyes are one of the most common problems affecting the eyes. You may experience a burning sensation, itchiness, redness, grittiness, irritation or the feeling that something is embedded in your eye. Some people often complain that when they experience a stinging sensation in their eyes, their vision becomes blurred, they are more sensitive to light and they have reading difficulties. Stinging eyes develop as a result of being exposed to dry air (indoor heating) and wind, seasonal allergies, smoking and airborne pollutants such as dust can cause the eyes to sting and burn. In addition, eye make-up, driving at night, poor eye protection in hazardous work environments, aging, menopause, not removing your contact lenses at night or changing them regularly as well as sitting in front of a computer screen can contribute to stinging eyes. When the eyes sting or feel irritated and scratchy, it may often be a sign of eye disorders such as dry eye syndrome (keratoconjunctivitis sicca), conjunctivitis (pink eye) or blepharitis. If your eyes begin to sting, rinse or splash water or apply a cold pack onto them. It is very important to take precautionary measures if your eyes are prone to stinging – avoid pollutants, use a humidifier if your environment is very dry and make sure that you wash your hands often when handling your contact lenses. There is a lot that can be done to keep your eyes protected from dust and debris. Wear goggles during times when debris or chemicals could go flying (such as wood shop, metal shop, science lab, or art or mowing the lawn). Similarly, when playing racquetball, hockey, skiing, or other sports that could injure your eyes protective measures should be taken. If small debris is caught in the eye, try not to rub the eye – as this may cause the particle to scratch the inner part of the eyelid. Rather gently splash the eye with tepid water (no soap!). Natural remedies can also help to wash out the eye. In fact, natural remedies have been used in traditional medicine for thousands of years to support the health of the eye. Med-Eye Wash is a 100% natural homeopathic remedy for the relief of bloodshot, itchy eyes and gummy discharge associated with common eye infections. Med-Eye Wash can be used to safely support the structures of the eye, without harmful side effects. This remedy contains a selection of homeopathic remedies known for their ability to address common discomfort in the eye, such as acute itchiness and general irritation. Due to the convenient tincture formula, when diluted, Med-Eye Wash is absorbed into the eye with ease – exactly when you need it! Calendula (D3) - is one of the most well-known homeopathic ingredients to soothe. Calendula helps to support healthy tissues, and also acts as an excellent general tonic for the eye. Agrimony (D3) - is a well-known astringent well known for its supportive capacity. Also contains Arg nit D5. Med-Eye Wash contains no alcohol or artificial chemicals and is safe for all ages and during pregnancy. 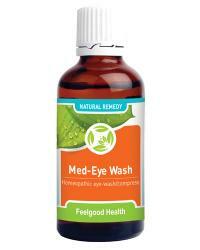 Med-Eye Wash is presented in a concentrated 50ml tincture formula, making it easy to dilute. Add 10 drops to approximately 50 - 100 ml warm previously boiled water. Soak a clean cotton swab or cotton ball in the solution and wipe the eyes from the inside corner out, using a fresh swab for each eye. Repeat three times daily until symptoms subside. For tired and bloodshot eyes, soak two cotton swabs in the solution, place over each closed eye and relax. Recommended for use with homeopathic Conjunct-a-Clear Eye Cure. Med-Eye Wash supports the body on a cellular level – helping to support soothed eyes and visual health - from the first application. Med-Eye Wash contains homeopathic ingredients in a tincture formula (for easy dilution) that facilitates rapid absorption into the eye – just when you need it! One bottle of Med-Eye Wash will last approximately 30 days (depending on frequency of use).